A surprisingly diverse walk in the heart of the 'burbs' with the ability to totally lose oneself from the hectic pace of modern life, the sounds of traffic, the visual pollution of human settlement. On the two times I have done this walk I have come across a mob of wallabies in different sections of the walk. How do you get to the start of the walk? Travel west along Hamilton Rd from Chermside Shopping Centre for about 3km and turn right into Trouts Rd. Car park is about 150m on LHS. 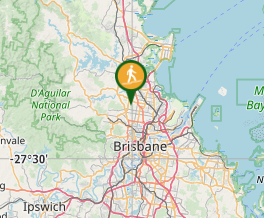 BCC Bus route 353 from Chermside to City or City to Chermside drops off on Hamilton Rd near corner with Trouts Rd. A detailed description of the walk! The first part of the walk follows the Giwadha Cct Track in an anti clockwise direction. 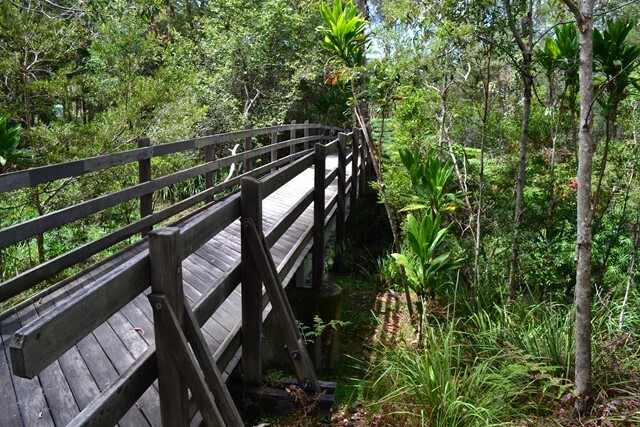 Cross the bridge over Little Cabbage Tree Creek and turn right towards the summit of Spider Hill. After summiting continue north for about 60m then turn left and continue the Giwadha Cct. The track winds around the hill then descends into a shallow gully which is crossed by a footbridge. There are heaps of grasstrees in this area. 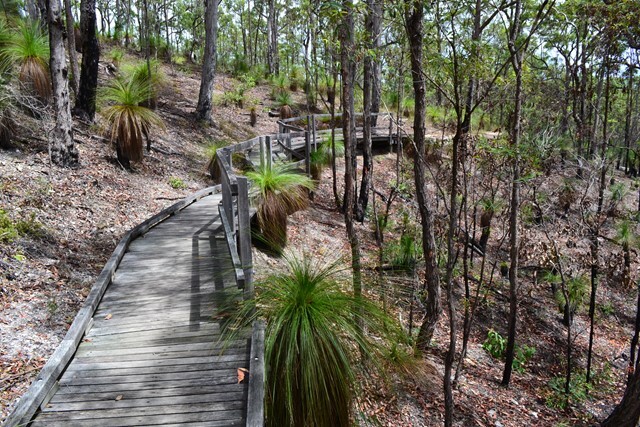 The track continues around a ridge and then down through a Heath area which in late winter and spring is covered with the yellow blossoms of pultineas and dogwoods, the golden candlesticks of banksias and the brilliant purple jewels of patersonia lilies. The track continues down to a cross road where a turn to the right followed by an immediate turn left to go under Hamilton Rd beside Little Cabbage Tree Creek. After clearing the hand rails drop into the grassed gully and climb out the other side and follow the track back towards Hamilton Rd to the end of the wooden fence on RHS. Enter through the gap between the wooden fence and the steel hand rail and follow the tree line with houses on your right until gaining the top of the ridgeline. You will have to cross a shallow gully which is a bit washed out before reaching the ridgeline. Turn left onto a management trail and follow through to Trouts Rd just before Rode Rd. Turn right and cross over Rode Rd and enter forest management trail opposite, just to the right of a large house with lots of blue-green windows. Follow this trail along the fenceline until reaching Downfall Ck. Cross over and turn left, following Downfall Creek over Partons Rd all the way back to Rode Rd. Cross over, turn left and immediately right into Raven St reserve. Follow bike path and take a 200m senses walking track cct before continuing along the bke path ignoring Creek Tk on RHS. At next junction turn right then left into Xanthorrhoea Tk. Follow this until junction with Waitara St Tk and turn left. At the head of a shallow gully and a sign saying Fire Trail Hamilton Rd 230m turn right and follow for about 200m looking for an unsigned footpad on the left at the top of another shallow gully. If you reach a low timber post and rail fence you have missed the footpad. Regardless strike left and head towards a bridge over Hamilton Rd at the top of the ridgeline. Cross bridge then turn right onto bitumen management road up to the reservoir tank. 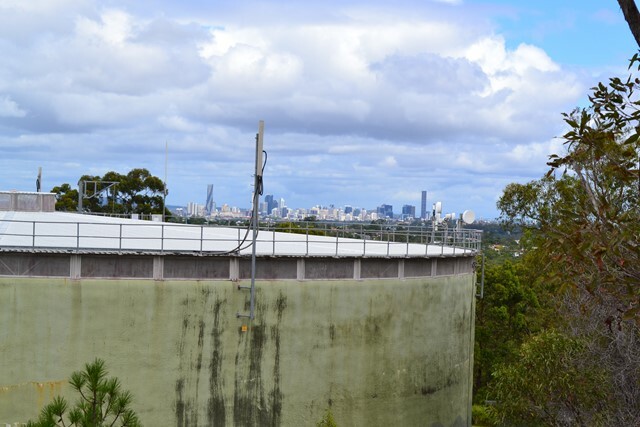 Bypass to left of tank and take walking track up to summit of Milne Hill for city views over the top of the tank. Continue past summit to end of fenceline and turn right back to water tank and pass on LHS. Head back down management road to where concrete meets bitumen. Turn left into foot track and follow around side of Milne Hill. If you are quiet in this area you may come across a mob of wallabies. Follow this track around and down ignoring tracks to left or right. At junction with concrete footpath (and dog park) turn left to road (Killarney Place). Turn right and follow road around to Trouts Rd and back to start. Directions for this walk are the WORST! People posting directions should do so in bullet point format, not block paragraphs of text that are impossible to read on an iPhone in the bright sunshine. We ended up just walking around all the little tracks for about an hour and finishing off the Giwadha track. 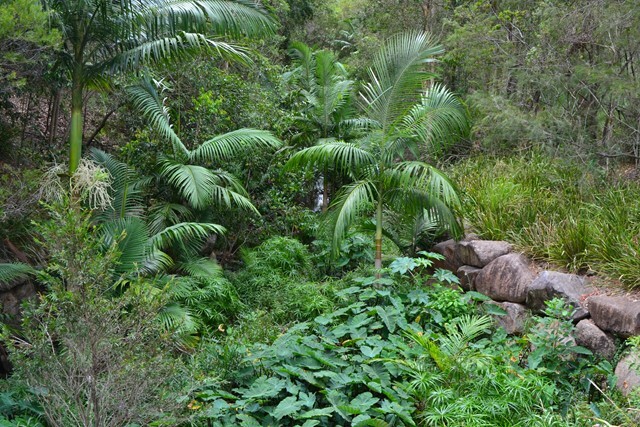 Well maintained bushland with little weed growth. 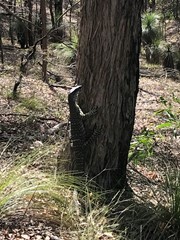 Saw a nice looking Monitor lizard and a few brush turkeys. Having just completed the walk it feels like we've been on an adventure. Following the directions was really fun. We did get confused a couple of times though. The worst time was near the beginning. We should have followed straight up to the top of spider hill but we saw the sign for the Giwadha track and followed that instead. If you set your mind to walk up to the top of the hill in the beginning you should be right. The hill isn't signed from the bottom. It confused us enough that we decided to just walk around all the other tracks in the area but managed to pick the track up where you go under Hamilton Rd. A pleasant walk and an easy-to-follow route description. I've fixed 1 error and updated a couple of details. Overall an easy walk with a slightly challenging gully crossing. A number of steps throughout, some bitumen tracks, concrete tracks, formed dirt tracks and some areas with no tracks at all (just grass). Today I saw some wallabies in the Trouts Rd Future Transport Route reserve, kookaburras, scrub turkeys and some water dragons.